I am pleased to announce that I have a new book out, published by Strange Attractor Press, and it is officially launched today. 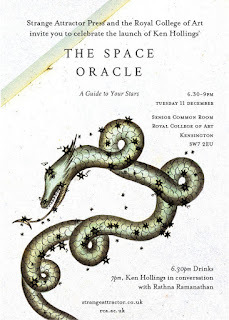 There will be an event at the Royal College of Art this evening. You can RSVP by clicking on this link - the password is SPACEORACLE@RCA. I will be posting further background information and illustrations from the book on this blog in the coming weeks, but in the meantime here is an overview, plus some comments on the book from higher sources. 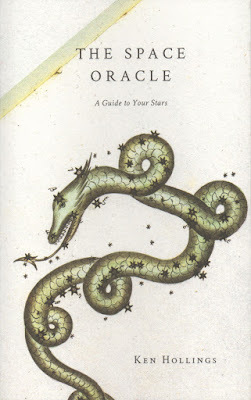 The Space Oracle reinvents the history of astronomy as a new kind of astrological calendar. This radical retelling of our relationship with the cosmos reaches back to places and times when astronomers were treated as artists or priests, to when popes took part in astral rites and the common people feared eclipses and comets as portents of disaster. Panoramic and encyclopaedic in its scope, the book brings astronauts and spies, engineers and soldiers, goddesses and satellites into alignment with speculative insights and everyday observations. The universe, Hollings argues, is a work in progress – enjoy it.